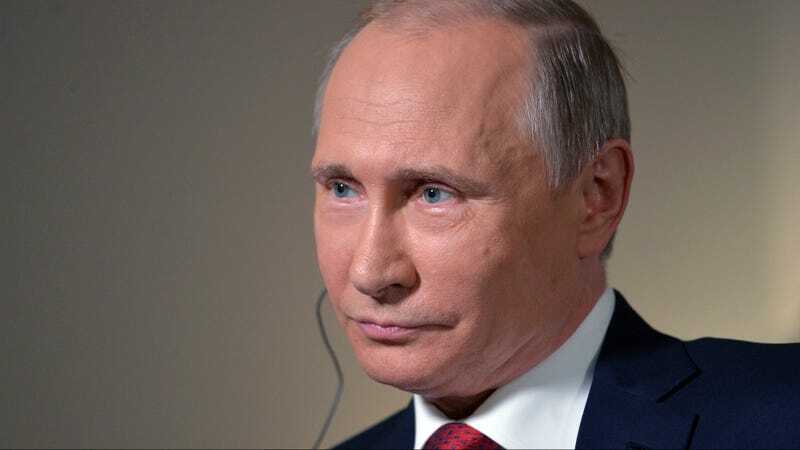 Russian President Vladimir Putin says Russia definitely didn’t hack the Democratic National Committee and expose embarrassing emails, but dang, he sure is glad someone did it. You know, for the American people. Russia has never done this...on a state level, says Putin. What about other levels, Vlad? The hack on the DNC was pretty embarrassing for Hillary, who has had a tense relationship with Putin over the years. An internal DNC probe by CrowdStrike Inc., a cybersecurity company, traced the DNC break-in to two groups it says are linked to Russian intelligence services. One, Cozy Bear, it says is affiliated with the Federal Security Service, the main successor to the KGB, while the other, Fancy Bear, it says is tied to the Main Intelligence Directorate, a branch of the Defense Ministry. James Lewis, a cybersecurity expert at the Center for Strategic and International Studies in Washington, said Russia’s “track record” of state hacking goes back at least a decade, so Putin’s denials aren’t credible. But still, nothing to see here folks.